Making the world a little sweeter, one cake at a time! Welcome to Caked! and thank you for viewing my website. My name is Debby Draper and I am a home-based cake business located in New Albany, Ohio. I specialize in fondant figurines and unique cakes for any special occasion. All of my cakes are made from the best recipes and I use a delicious, fluffy buttercream that keeps my clients coming back for more. Additionally, I offer nut-free, dairy-free, soy-free, organic, dye-free, or gluten-free options as well as cupcakes and custom-decorated cookies. I have always loved to bake since my mother began teaching me at a young age. I enjoy making delicious, beautiful desserts and seeing the smiling faces of those who appreciate them! I began cake decorating after it became difficult to find a bakery or store that could guarantee a nut-free cake for my peanut-allergic daughter. I have a backround in art and interior design and incorporated my passion for design with my love of baking to decorate beautiful custom cakes. I soon began receiving requests from family and friends to make cakes for their special occasions, so I took various cake decorating classes to further enhance my craft. As word has spread, I have found the opportunity to work from home doing something I absolutely love! I have since been able to expand my availability to the public and created Caked!. So, what is the price? That is always the big question. My cakes are priced according to number of servings (or size of cake) and extent of labor involved. A good rule of thumb is to figure $3 to $4 per serving. Of course, the simpler designs without many embellishments or intricate design work will price out at about $2.50 to $3.00 per serving, while tiered cakes with fondant figurines, sculpting or painting can price at $4.00 or more per serving. Initial consultation will be $25.00. This includes planning and design, sketches, in-person or phone conversations, e-mails, scans and photo downloads. You can refer to my Rates and Services page for estimated prices and I am always willing to work with any budget. I am happy to meet with you by phone, e-mail or at my studio for a design consultation where we will work together to create the perfect custom cake for your occasion. I will draft a sketch during consultation and will follow up via e-mail with a final design and Purchase Order for your approval. I am available locally in the Columbus, Ohio area and offer pick up for standard sized cakes. 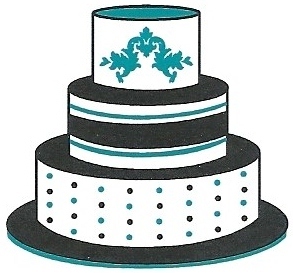 Large tiered cakes or specialty cakes that require on-site assembly will be delivered for $35. Please feel free to contact me with any questions or inquiries. See the Contact Us page for information. Thank you for considering Caked! to create a fabulous cake for your event!